Awww! It's Freddie's first Halloween! And despite the look on his face he was ok in the Baby Bat costume! 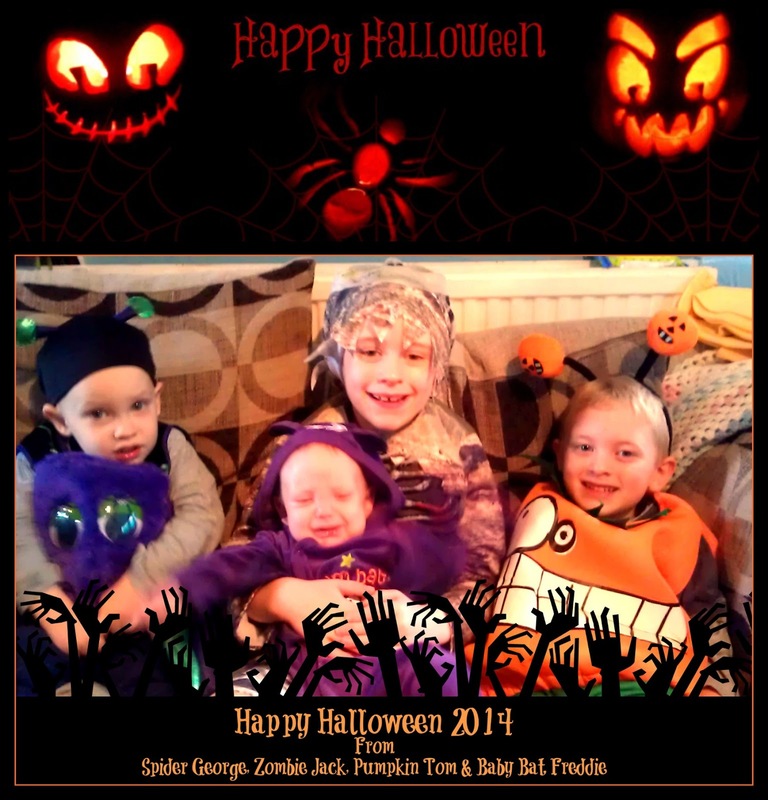 Georgie wore a Spider costume because he is currently obsessed with "Mr Skinny Legs" (thank you Peppa Pig), Tom wore the Pumpkin costume that he'd asked for last year and then refused to wear in favour of one of Jack's old Skelly costumes, and Jack was a Zombie for the second year running. 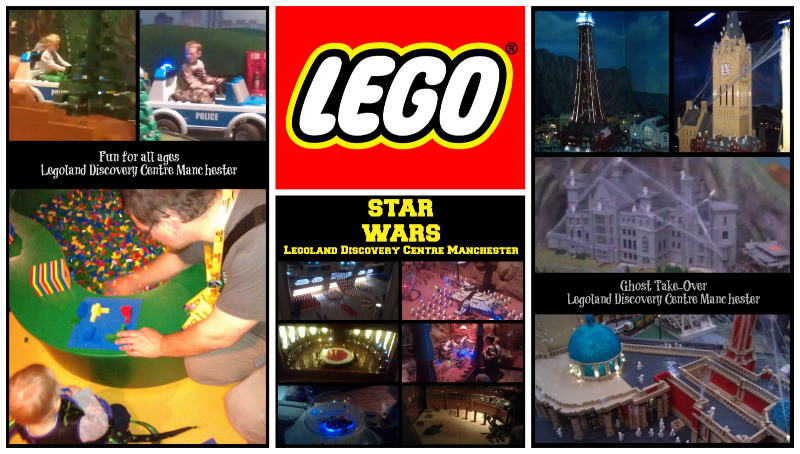 Since last years trip to Legoland Discovery Centre Manchester being such a hit with the kids we thought we'd do it again this year! It's Brick Or Treat time! We pre-booked out tickets online and got in pretty quickly and the kids collected their limited edition Halloween 2014 Lego Brick at the end of the Factory Tour! It was great to see all the ghosties had taken over Miniland again, it's super spooky and the kids thought it was great. Perfect for Halloween! We rode the Kingdom Quest ride and got our photo put into a fridge magnet - me and the Hubby look to be taking it way too seriously! The we let the boys loose in the play area! Jack & Tom made a bee line for the Lego Construction Site Soft Play Zone. We stayed with Georgie building things in the massive brick tubs. Then we went to watch a 4D movie! Last year we caught the Chima movie, this year we watched Spell Breaker. Jack & Tom loved it, Georgie got into it once we worked out he needed to wear the glasses (he is only 2), and Freddie just snuggled in for a cuddle! Jack was straight back into the soft play after the movie, the rest of us went to the Lego Racers Build & Test area to make some cars! We had a bite of lunch and the kids had another play. Georgie spent some time in the Lego Duplo Farm area - perfect for the little ones - while Jack worked on his construction and design skills on the Earthquake Tables, and Tom dragged his Dad on to the Merlin's Apprentice ride. Then both the bigger boys drove round in Lego Police cars on the Forest Pursuit Driving School! We went to look at the rest of the displays, Jack was so excited by the Lego Star Wars display they have at the moment and tried every single interactive bit he could find! It did look awesome! Me and the Hubby were very impressed too! And right before we entered the shop (where the kids and Hubby cleaned me out of my last few quid) Jack had a go at the Lego Ninjago Laser Training and went all Mission Impossible! It was fab! Had I not been baby wearing Freddie I'd have had a go myself! So we loved it! We didn't go round everything, but we did get round some things we missed last year, and the kids have made us promise to take them again next Halloween - Brick-or-Treat is becoming a real family tradition for us! Should I mention that they do a Christmas event too.....?